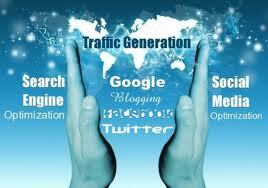 Traffic generation is a very crucial aspect of blogging that cannot be neglected. Most bloggers and webmasters try to shy away from this very important aspect, and it doesn’t go down well with them. For instance, it is because of traffic that you are reading this post now. Okay let’s break it down this way. Your blog or website is your shop, your blog contents are the goods you are selling, while traffic is the customers that come to buy your goods. So you can see that there is no way your shop can survive without customers, that’s why traffic generation is very important in blogging. I am going to show u some simple techniques I use to generate tons of free traffic to my blog, that is to say that I am going to show you how to attract plenty customers to your shop. But first of all you must understand that the secret of traffic generation is being consistent in adding new and juicy contents to your blog on a regular basis and if possible make it daily. This singular act will make your readers glued to your blog because they wouldn’t like to miss the fresh contents. Keep reading as I reveal the secrets of massive traffic generation. The first method of driving massive traffic to your blog or website is by utilizing the free services of social bookmarking sites. These social bookmarking sites usually have very high traffic hits per day. What they do is to publish your site contents and links to the millions of people who visit their site each day. There are a whole lot of social bookmarking sites scattered all over the internet, and visiting each of them to post your contents and links could be very tiresome. Voila am going to introduce you to these two similar sites which have solved the headache for you by collating over fifty social bookmarking sites, and posting your links and contents to them one by one. Hmm! I can hear you heave a sigh of relief there; the two sites are www.socialmarker.com and www.sociallist.com. They both perform the same function so I will advice you to use any one of them to avoid double posting. Just visit the site and read their instructions on how to use it. I stumbled over a site where you can submit your blog or website to generate thousands of backlinks and thereby increasing your search engine ranking. here is the link http://www.activesearchresults.com it might also be of help. Another way of driving traffic to your blog is by posting relevant contents with links to your blog on high traffic forums. Forums like www.naijaloaded.com, www.nigerianbestforum.com, www.nairaland.com, www.gurusbase.com, www.naijacliq.com, www.naijahotjobs.com etc are high traffic forums owned by Nigerians. So all you need do is to register with them and keep dropping interesting contents with links to your blog. NOTE: most of these forums prohibit the act of dropping your web and email addresses, and have configured their system to delete any such post. But you can trick the system by writing your web addresses like this. Instead of typing www.homebusinessmanuals.com, you can type it like this “home business manuals dot com” so that their system won’t detect it. This is another way of getting free organic traffic to your blog or website; it is also called “Link Building”. Just look for other blogs and sites in your niche and drop interesting comments on them. These blogs usually have comment box where you can drop your comments and your blog or website URL. People who are captivated by your comment can easily navigate to your blog or website. Just do a google search to find other sites in your niche, and then try to drop relevant comments on as many of them as you can, and see how your blog traffic will grow. This is another interesting method of generating free traffic to your blog or website while making money. It is just like having a list of customers to whom you can sell your products. There is this popular saying which says that “There is Money in the List”. You can always mail the contacts on your list whenever you have fresh contents on your blog, and they will com visiting. On the other hand, you can use your list to market your information products. Ok let’s assume you have 5000 valid contacts in your list, and you are selling an information product for lets say N1000, and only 2500 contacts bought your product. That a cool N250, 000 straight to your bank. So you can agree with me that there is money in the list. In my next post, I will be showing you how I was able to build a list of over 5000 subscribers in just 1week, and how I use it to make money into my bank account almost on a daily basis. This method entails submitting your keyword rich articles embedded with your links to article directories. These article directories collect millions of articles on varying topics per day from bloggers and webmasters. Many people visit these directories to search for articles and when they click on your links, they are then linked back to your site. Some of the popular article directories include. www.ezinearticles.com, www.articlesbase.com etc just visit there site and see for yourself. You can also do a google search to find more. This is another way of advertising your site and products to millions of internet users. What they do is to help you create banner ads or text ads for your site or blog. Some also have the option of targeting a particular audience. There are a lot of them on the internet, just do a google search of “free classified ads” and see what you will get. Learn how it works and apply it to suit your needs. This is another great way of generating traffic to your blog. If you are an ardent blogger, you would have noticed that there is hardly any serious site that doesn’t have the RSS FEEDS installed on their site. Because of time, I can’t give you details on this particular topic. You can do a google search to learn more on RSS FEEDS and how it works. New methods of traffic generation have been discovered in recent times. I will update this post when I lay my hands on them. But if I have omitted something, or you want to make a little contribution, feel free to drop your comments in the comment box below. Apart from utilizing all the above methods of traffic generation, submitting your site or blog to Yahoo and Google search engine is very crucial if you really want your site to rank high in google and yahoo search results. In my next post, I will show you how to submit your blog or website to Yahoo and Google. If you don’t want to miss my future posts, please subscribe to my blog so that you will get my future posts delivered straight to your mail.